Putting down this book I ask myself how much I remember of it. As much as the scattered memories of a long voyage after having returned home. Or as much, perhaps, as what one remembers of a dream when awake. 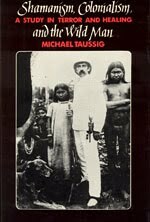 How much do I know of what this book seemed to be about while I read it - the Putomayo Indians, the Colombian rubber trade, colonialism, torture and healing, and shamanism? I remember the “space of death”, the space of terror that cannot be reduced to rational economic motives, the image of a predatory capitalism that has derailed and reassembled itself as the monster it imagined the natives to be. I remember the crossings of Joseph Conrad – who suddenly appears so petty bourgeois and narrow-minded – and poor Roger Casement. I remember the long, horrible discussions about whether the slavery along the Putomayo was really slavery or merely “debt peonage”, as claimed by the rubber barons, repugnant success stories like Julio César Arana, head of the Peruvian Rubber Company. And I remember thinking: how fuzzy and even non-existent the borders are between slaves, traders, wage laborers and family members. Just remember all the countless daughters who have been sold by their parents, in countries where slavery was nominally abolished centuries ago. And how fluid these categories are in our society today as well! I remember the sadness I felt when I read about people like Rosario, Marlene and her father, or Santiago. I also remember another point of interest: Taussig’s insistence that the dreamlike mist surrounding these historical memories, reports and colonial fantasies should be retained and not reduced away. Like Conrad, we - the searching critics - should “penetrate the veil while retaining its hallucinatory quality”, and like Benjamin, we should approach interpretation in a combined act of “reduction and revelation” (p 10). Myth is subverted by myth. Unlike the immanent criticism of Adorno, this is not a rational endeavor, taking aim at the intellectual closure of identity-thinking. It’s an emotional voyage in the style of Benjamin, relying on a visual or perhaps a tactile groping one’s way through fog or through dream, hoping for a dialectics to be set in motion which will guide us towards awakening. What would get lost if we tried to reduce away the mist would be the “sense of reality crucial to the moral character of social relations”, which is diffused through society, providing it with its emotional props and supports. Society, Taussig suggests, is not only served by explicit ideologies, but also by a “poetics of control”, an “implicit social knowledge”, or by what Raymond Williams called a “structure of feeling” – a “communal possession with all the firmness that structure suggests, yet operating in the most delicate and least tangible aspects of our activity” (p 288, 366). The task of the critic is to engage this reality, making it crack open through the skilful applicaton of dialectical image and montage, and thus tapping into and releasing the “creative power of chaos” underlying it. I think here of Helena Flam, who writes about how social structures are upheld by “cementing emotions” like gratitude or loyalty, but also by feelings of shame or fear. Social movements must operate with “subversive counter-emotions” to shock, disrupt and undermine the emotional structure of the status quo and release "subversive counter-emotions" like anger, pride, hope and wonder (see the volume Social Movements and Emotions, edited by her and Debra King and published at Routledge 2005). Criticism, Taussig suggests, is "sorcery". It proceeds through the medium of the dream. And why? Because it’s the only way out. The dream is reality, or at least it structures reality. And I remember the descriptions of the Colombian shamans' yagé nights (the quip, which I read somewhere, that Taussig is a high theorist who writes like a beatnik is true). I also remember, but more vaguely, the attempts to theorize these nights. They belong with the sacred, taking place as a communal ritual, but lack the “unity” which Turner sees as characteristic of the communitas of ritual: “the movements and connections involved here between self and group are not susceptible to the communitas model that Victor Turner postulated as a universal or quasi-universal feature of ritual”. Against the fantasies of unity, “the yagé nights pose awkwardness of fit, breaking-up and scrambling, the allegorical rather than the symbolist mode, the predominance of the left hand and of anarchy” (p 442). Instead of unity, there is disunity, as in the montage as theorized by Benjamin. The yagé night is marked by radical heterogeneity. It is a “sensory pandemonium”, a dance of leaping shadows, a “chaotic mingling of danger and humor”. You don’t know how they will turn out. You will laugh, but you will also vomit and feel sick. Everything is hallucinatory and intense, but also full of unexpected, dreamlike reversals, connections and juxtapositions. So much laughter. “It belongs to the family of the pun”, Taussig quotes Barthes. “It is on the side of carnival”. The book too is like a dream. It cannot be pinned down to any of its constituent parts. It’s a montage. It points beyond itself. Teikoku shônen - art nouveau punk? Hegel, Waszek and Adorno: What rose? What cross?